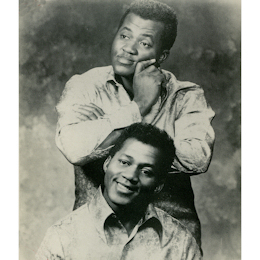 As readers of these pages can tell I’m a sucker for that oddest of soul genres, the male vocal duo. And Hal and Harold Degraffenreid – they really were twins – are amongst the rawest and most intense examples of the style. They came from Burlington, NC, born on 8th May 1944, but moved to Detroit in 1957. They sang in church choirs and were “discovered” singing gospel music by producer Johnny Griffith who recognised their special talent. Griffith recorded them in April 1966 cutting the northern soul anthem “Quick Change Artist” at their first session. This is handclapping Motor City at its most uncompromising and despite the twins doing their best they are almost drowned out by the pounding rhythm. The slightly more restrained flip “Give A Man A Chance” allows them a little more room, but neither this nor either side of their second Karen release gives anything other than a hint of their vocal ability. I’m quite sure their club appearenaces, which they started as Billy & Bobby - The Soul Twins, must have been far more dynamic and soulful. The mood of their 45s changed in 1968 when Griffiths recognised that the guys were better suited to a more “southern” approach. This trend started with a version of Otis R’s “Mr Pitiful” on which a much less cluttered arrangement and heavier bass and horns combination enabled the guys to start to rise above the musicians. But a female chorus still intruded, as indeed it did on the flip “Searching For My Baby”, a version of the Bobby Moore tune. For the next 45 Griffiths at last achieved an environment that showed how good the Twins were. 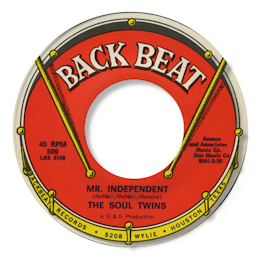 He leased the marvellous Mr Independent to Houston’s own Don Robey – an appropriate move as this deep soul classic sounded every inch a “southern” recording. And what a difference it made. Now you can hear the full righteous fire that Hal and Harold contained in their voices. Check out the gospel call and response approach they take, and the heavenly harmonies when they come together. One of soul music’s essential tracks. Their final 45 almost matched its fervour. 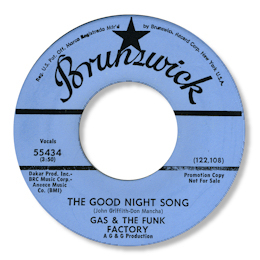 Hiding behind the strange “Gas & The Funk Factory” name on Brunswick for some reason, The Good Night Song was clearly the twins with their slightly lisping delivery. This track too is indispensable – check out the superbly gritty vocal, the tasteful guitarist and pianist behind them and the full horn section. Sadly this was to be their last secular release – they went back to gospel music and did release a cassette of their music, still screaming their lyrics like there was no tomorrow. The Baptist church’s gain was soul’s loss. But Dave Porter did release an album of all their soul tracks, which included several unissued cuts, amongst which was an ultra soulful version of Two Lives which would have you convinced it was recorded in Memphis if you didn’t know better. Many deep fans will know this song by the issued cut by Willie Collins, but I have to say the Degraffenreid boys knock it into outer space. Simply wonderful. 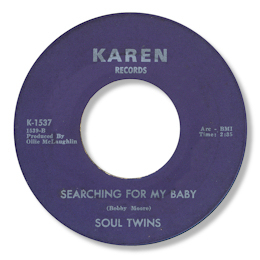 Note ~ This LP has every track recorded by the Soul Twins and should be in every self respecting soul lovers collection. In addition to “Two Lives” this LP includes the following unissued sides – “Can’t make this move”, “I’ve got a whole lot of lovin’”, “Soul is in the air”, “What good is love”. Thanks to Dave Porter and Barry Lazell.